Lucy brought me gorgeous mini polish from Germany, that has douchrome flakies. Since Glam Nails Larissa shade is quite watery, I decided to layer it over darker base. But I just could not decide which one to use. So I ended up with skittles manicure. 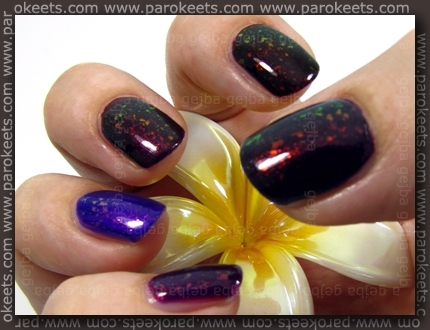 I used following polishes: Rival De Loop – Purple Rain; H&M – Purple (no. 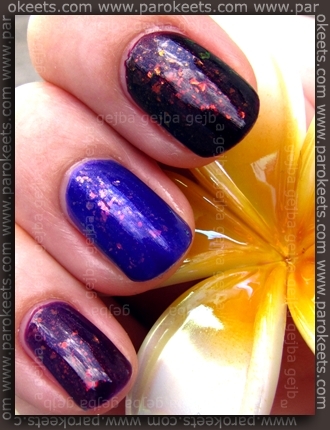 432); No 7 – Damson Dream; Flormar 323; Essence – Thelma; Glam Nails – Larissa. This is skittles manicure without the flakies (polishes are in the same order as on the first photo). I had help in the form of a flower from H&M. Next I used two layers of Glam Nails Larissa polish, but I still didn’t manage to get even coverage. They say practice makes perfect – so I’ll just have to practice more. Larissa consists of violet base with douchrome flakies and shimmer suspended in it. 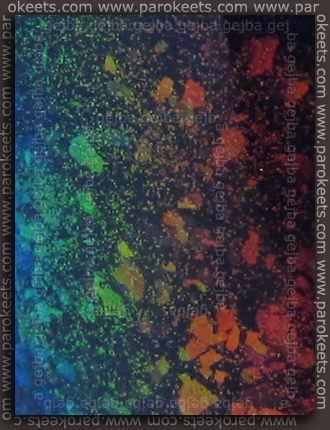 Flakies actually remind me quite a lot of Gosh Rainbow ones. So,which base do you like the most? P.S. Almost everything is ready for our next giveaway. After we hit 300 Google Friend Connect followers, one lucky reader will be given an opportunity to win a huge amount of make-up goodies. .-= Maestra´s last post … Hot Neon NOTD: Orly – Orange Punch =-. Lovely! I love the base on your pinky, thumb and index! The pinky is a real surprise. I didn’t thought this base would look that nice! .-= Annigje´s last post … Contest Look: Parfumflesjes =-. Lucy just told me that she bought Glam Nails polish in Muller, but she doesn’t think all Mullers carry this line. 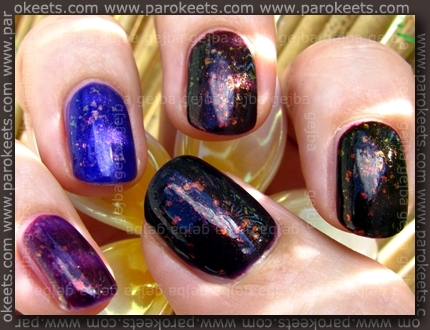 I like the flakies on all the bases, it’s definitly something that can be layered on everything. 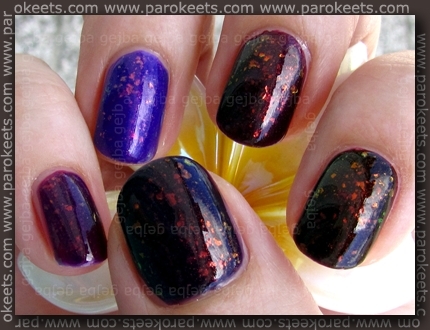 But since I’m kind of digging the vampies lately, I’d choose a full mani with No 7 Damson Dream!